Here is Some Information about Thakurbari Temple in Gangtok Sikkim India. Dedicated to: All the major Gods and Goddesses of Hinduism. The Thakurbari temple is located in the heart of Gangtok town in Sikkim. 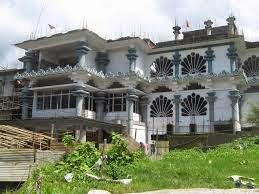 It is regarded as one of the oldest temple in Sikkim.The temple was built in 1935.The temple houses almost all major deities and has emerged as an important center of convergence for the Hindu community of Gangtok.It was constructed on a prime piece of land donated by Sir Thutop Namgyal, the former Maharaja of Sikkim. The temple houses many idols and images of all the major Gods and Goddesses of Hinduism. The temple organizes many festivals and social events on a grand scale. 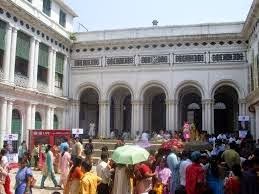 The Thakurbari Temple was constructed on a land donated by the Chogyal of Sikkim in the year 1935. During the year 1945-47, the shrine was renowned to a major temple complex. Also, construction works began last year, for inclusion of a multipurpose hall and a library to the complex. By Road : Gangtok is well connected by roads. National Highway 31A connects Gangtok to Darjeeling, Siliguri, Kalimpong and other mountain locales. Regular tourist buses, coaches, taxis and jeeps run daily to and from Siliguri, Bagdogra, Darjeeling and Kalimpong to Gangtok. From Gangtok Bagdogra, Siliguri, Kalempong and Jalpaiguri lie at a distance of 124 Kms, 114 kms, 75 Kms and 125 kms respectively. By Rail: Nearest railway stations to Gangtok are New Jalpaiguri Station and Siliguri Station. It is located at a distance of 126 kms and 114 kms respectively. Both stations are connected to all the major cities of India. and these places are well connected to Gangtok by road. From station regular tourist buses, coaches, taxis or jeeps are available to reach Gangtok. By Air: Gangtok Nearest airport is Bagdogra in West Bengal. 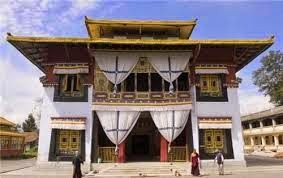 It is located at a distance of 124 kms from Gangtok and it is well connected with other cities of nearest state like Delhi, Patna, Imphal, Kolkata, and Guwahati. From the Airport regular buses, coaches and taxis are available, that take around 4 hours to reach Gangtok.